Remember when I told you about my trip to New York City? I’d had my hair straightened? Turns out, I was on my way to meet my literary agent. The literary agent I had hoped for from the get go. The literary agent who’d written about consciousness and authenticity on her website. The literary agent I’d perused for over a year. I’d spent days picking out just the right outfit. A sleeveless short navy dress with a long matching jacket. “Cityish, right?” I’d asked my husband. “Just be yourself,” he’d replied. “Shoes or boots?” I’d asked my sister-in-law once I’d made it to Connecticut. “John,” I gave him a knowing look. “Be myself?” Here I collapsed my knees in a buckling motion while simultaneously throwing my arms in the air and accidently hitting myself in the head with my bag. When he asked if I was sure I knew where I was going, I pulled the notepaper from my bag, flapping it in front of his face. An hour later I was in The City, standing in Grand Central with two hours to make it to the Upper West Side. Bathroom. Hair still straight. Check. Outfit smooth and stylish. Check. Michael Jordan Steak House. Check. Cab to Central Park West and 61st Street. Hmmm. 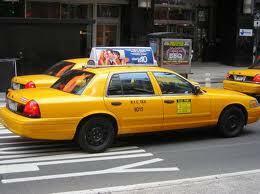 “A cab stopped!” I yelled into the phone. “Good. Get in it!” my brother yelled back. I stepped forward, trying to get my bag into the back seat first. I was fumbling to hold onto my phone. Then I watched as the lid of my smoothie caught on the lip of the cab door. It took me a moment to realize what had happened. Smoothie dripped from my eyelashes. It fell from my hair. I could feel it traveling inside my left ear. When it hit the ground it splashed up between my legs. The front of my dress and jacket were covered. COVERED. The back seat of the cab was sloshing with smoothie and suddenly the street was full of honking cabs, waiting for us to move. I stood frozen, clutching the roof of the cab. “Um, do you have any napkins?” I asked the cabbie. He threw a bunch my way. I wanted to close the cab door and tell him to have a nice day. The smoothie moved like a giant yellow blob as I pushed it across the back seat. “Um, do you have any more napkins,” I asked. More napkins came my way. I tried to wipe the front of my dress and ended up with white napkin lint on top of the baby-puke colored stains. “I don’t know if I should laugh or cry,” I said to the cabbie. Another wad of napkins fell in my lap. I laughed and laughed and laughed all the way to the Upper West Side. I called my brother from a park bench in Central Park. “It’s like Glee when they get slushies thrown in their faces?” he said. And he was right, there were. Only each dress shop was teeny-tiny, filled with a select few teeny-tiny dresses that cost like 500 dollars! My “city” outfit and jacket had come straight off the clearance rack at TJMaxx. I was running out of time and not sure what to do. Wear what I had on? It’d make a great story, but seriously, it wasn’t an option. I’d come upon Shopping Nirvana. A three-story discount designer store called Century 21. It was like TJMaxx on steroids. As soon as I got off the escalator on the second floor, I saw it. It was Calvin Klein and looked like I’d had it made to match my shoes. What about you? Any embarrassing story you’re willing to share. Please? Next week, Part II – I’ll tell you all about the meeting with the literary agent and give you a full update on the book!